Valentines is just around the corner and you know what we need? If your first thought was donuts then you and I just became best friends! Donuts are what we want and donuts are what we are going to have. Cream together the butter and sugar until it is nice and fluffy. 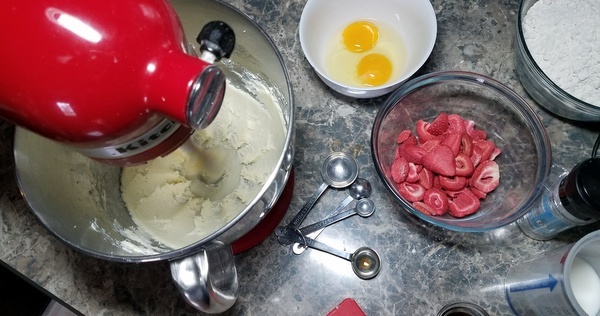 Add in an egg, egg yolk, vanilla extract and milk then mix until combined well. In a separate bowl sift together your dry ingredients (aka- flour and salt). Add them your butter mixture. Now let’s pause a moment and talk about our studly ingredient, the freeze dried strawberry. First of all, I am so glad you are listening…the little seeds of knowledge are sticking (insert happy dance)! Now to answer your questions…while fresh is best in pastries that involve a fruit filling in this scenario we aren’t going to fill the donut but rather have the strawberry flavor flow throughout the donut itself. If we used fresh strawberries, the water and/or juice would extra moisture to the dough making it a gloppy mess. Using freeze dried gives you that strawberry flavor, without the extra juice making this the ideal companion to our Valentines Dream! Ok, where were we? 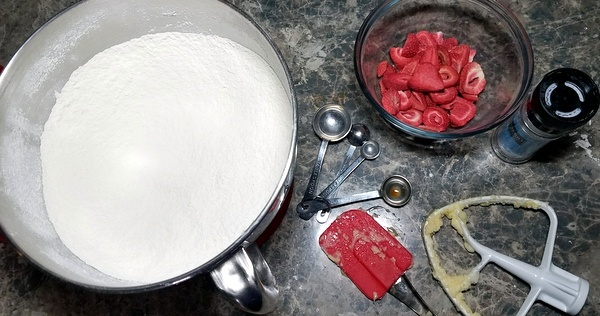 Oh yes, add in about ¾ cup freeze dried strawberries to the bowl and mix until it is just combined. DON’T OVERMIX…it would be tragic! Lightly flour a clean surface, turn the dough out onto the surface and knead gently until the dough becomes smooth. Roll the dough out to ½ inch thickness. 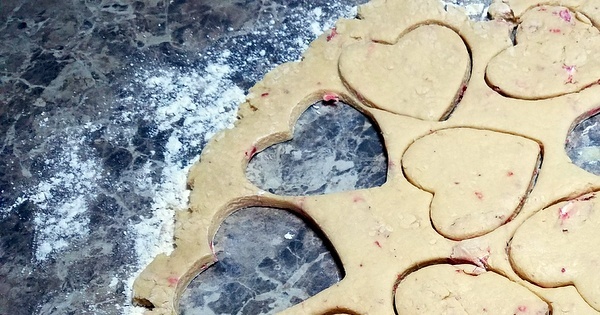 And since it is Valentines Day go ahead and use a 2 ½ inch heart shape cookie cutter to punch out our dough. Aren’t they adorable? 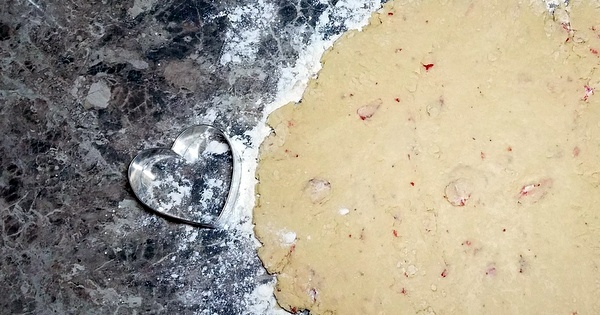 **You can re-roll this dough but just make sure to cut out as many hearts as you possibly can. Overworking the dough can make it tough. You should be able to get about 18 hearts total. The dough should be puffed, golden brown and cooked through…you may have to test one or two- what a burden to bear! Allow to rest the donuts on a paper towel lined plate so excess oil can drain. Allow to cool completely. 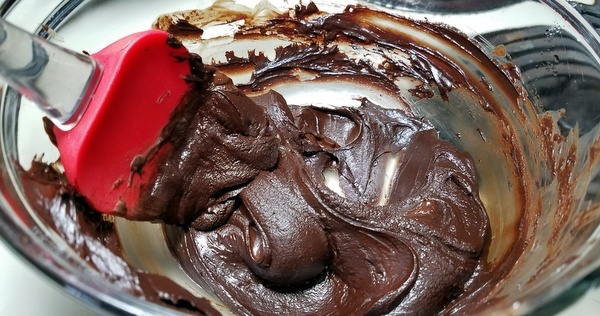 While our pretty’s cool let’s whip up some chocolate ganache…place some dark chopped chocolate and light cream (I used half and half) in a heatproof bowl set over a simmering saucepan of water. Make sure the bowl base does not touch the bubbling water. Stir gently until the mixture melts and becomes smooth. Remove the bowl the bowl from the heat and allow to cool to room temperature. Stir it occasionally as it cools for about 1 hr or until it is a spreadable consistency. I don’t know about you, but I could dive right into that bowl! 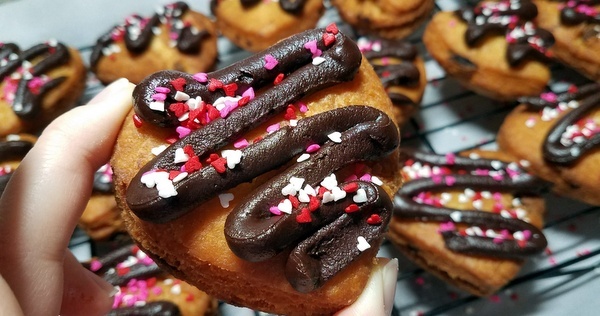 Spread the tops of the cool donuts with chocolate ganache and let your freak flag fly with some sprinkles if you wish! 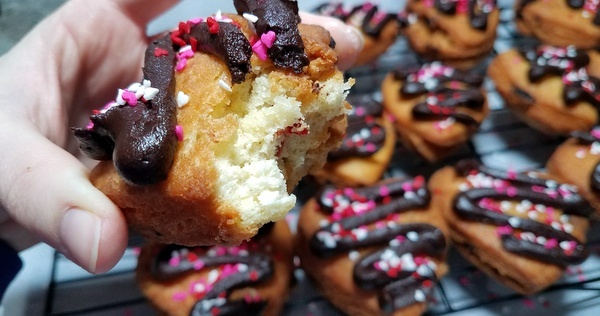 Sorry, donuts are definitely my love language and I bet after taking a bite of these they’ll become yours too. Let me know what you think in the comments below or if you have any requests I would love to explore the world of flavors with you! 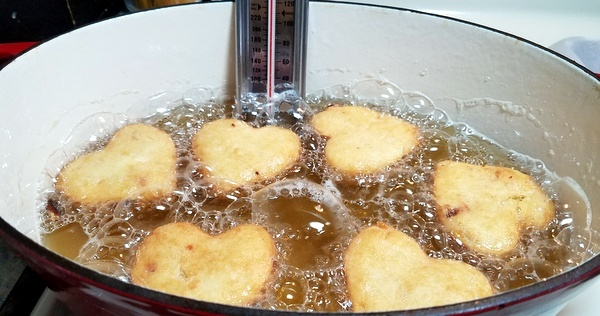 Vegetable or canola oil for deep frying. To make the donuts- Cream the butter and sugar in the bowl of a stand mixer until nice and fluffy. Scrape down the sides of the bowl. Add in the egg, egg yolk, milk and vanilla extract. Mix until well combined. Sift the flour and salt over the top of the wet ingredients. 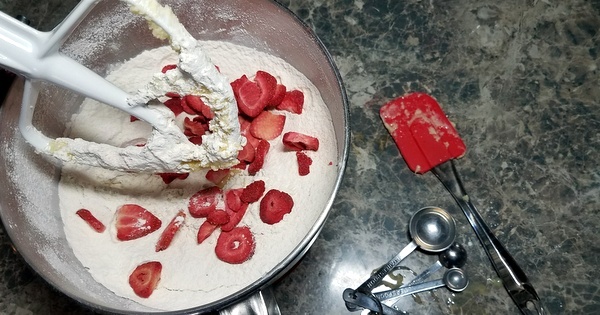 Scatter the freeze dried strawberries across the flour mixture then gently mix together using the lowest setting of your stand mixer until the dough is just combined and a little crumbly. Pour the dough out onto a lightly floured surface. Knead a couple of times until you form a smooth ball of dough. Roll the dough to ½ inch thickness. 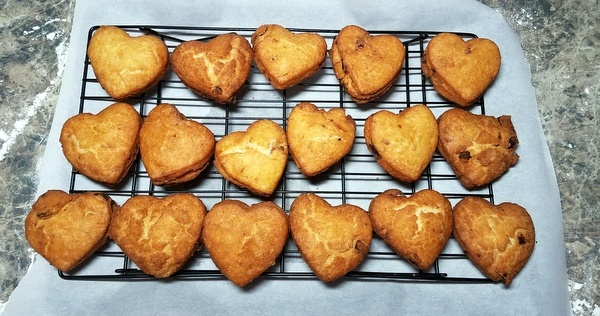 Using a 2 ½ inch heart shaped cookie cutter cut out 18 hearts. You may re roll the dough 1-2 times more in order to get this amount. Heat the oil in a dutch oven or heavy bottomed pot to 350 degrees Farenheit. Fry the dough in batches until the dough is puffed and golden brown, turning occasionally in the oil. This will take about 2-3 minutes. Transfer to paper towels lined plates or baking sheets to drain the excess oil. 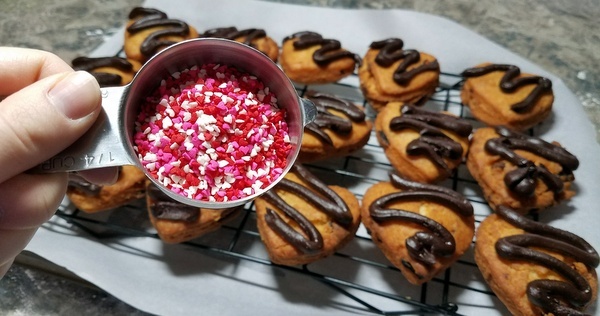 Allow the donuts to cool completely before decorating. To make the chocolate ganache- place the chocolate and the half and half in a heat proof bowl. Set it over a pot of simmering water, but don’t have the bowl touch the water. 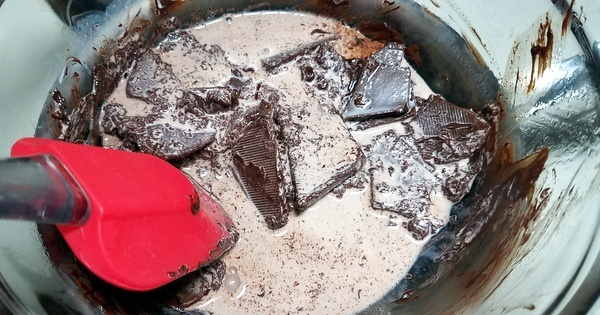 Using a heatproof spatula, gently stir until the chocolate and cream have melted and combined into a homogenous mixture. Set aside and allow to cool for an hour stirring every so often till it’s a spreadable mixture. 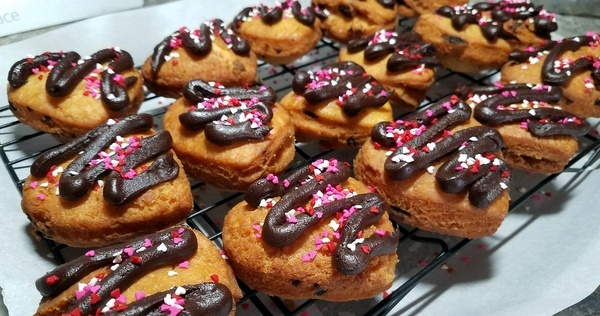 Scoop the ganache into a piping bag then pipe the ganache over the cooled donuts. You could also frost the donuts using an offset spatula. Add sprinkles if you desire. Enjoy! I am thankful for my three boys who have turned out so well. I ha&n#ve39;t always been a perfect parent and I'm thankful that God helped me along the way. Thanks for the great give away!